CE and RoHS safety certified for securely use, and compatible with kinds of battery for convenient charging. CE and RoHS safety certified, and rubber oil surface, fireproof and corrosion proof for securely use. 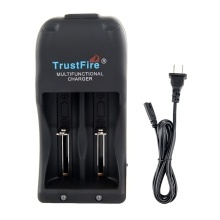 Compatible with 3.0-4.2V 18650, 26650, 25500, 14500, 18500, 17670, 17500, 16340 rechargeable battery. 2 slots for quick and convenient and quick charging. Rechargeable battery&apos;s voltage should be above 2.7V. If not, the charger is not used.